Alexi Thatcher, who played Saint Lucia during a Santa Lucia/Festival of Lights event at the Ephraim Co-op last weekend, reads fairytales to children from the audience. 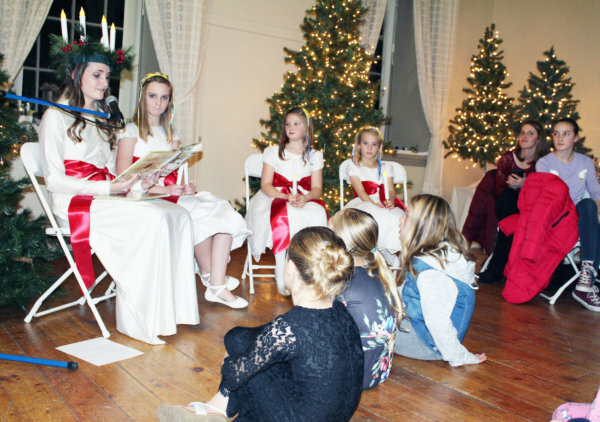 EPHRAIM—Participants in the second Santa Lucia celebration, sometimes called the Festival of Lights, enjoyed an authentic Swedish celebration last Saturday, Dec. 15 at the Ephraim Co-op. The event, featuring a menu of salmon, beet-and-apple salad and other Scandinavian dishes, was catered by Cow Camp Catering of Axtell. Alexi Thatcher, holding candle, and others in the processional, wait for a crown of candles to be placed on Alexi’s head during Santa Lucia/Festival of Lights celebration at the Ephraim Co-op last weekend. Alexi took the role of Saint Lucia. Gloria Winter, of the Ephraim Co-op Board, and Jan Jonson, who was born in Sweden and has spent time there as an adult, kicked off the event. Winter announced each item on the menu in English, and Jonson gave the Swedish translation. Then Winter told the legend of Santa Lucia: She was a Christian married to a pagan, and she carried food to the persecuted Christians who were hiding in dark catacombs below the streets in Rome. To free up her arms so she could carry more food, she put candles on her head to light her way. Ultimately, she was persecuted, blinded and killed. Later, the Catholic Church declared her to be a saint. Much later, people in a coastal town in Sweden were on the verge of starving. According to legend, a boat docked, and a woman with candles on her head came ashore and delivered food. Dec. 13, the darkest day of the year, is Santa Lucia Day in Sweden. In families, the oldest girl assumes the role of Saint Lucia, wears candles on her head and serves a special breakfast consisting of a bun (“lussekatter”) and coffee to the family. Ephraim City Councilman Greg Boothe leads audience in Christmas carols at conclusion of Santa Lucia festival. lowed by “star boys” in cone hats carrying wands with stars on the ends. After Winter explained the history festival, lights in the Co-op were turned off. Saint Lucia, played by Alexi Thatcher, daughter of Richard and Larissa Thatcher of Parowan, and a granddaughter of Jan Jonson, said a few things about the meaning of the event. Then she and her entourage, lit by the candles on Alexi’s head, walked among the various tables. 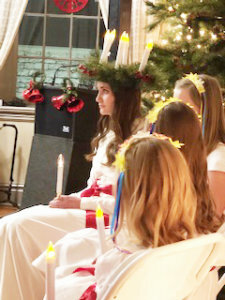 Others in the Santa Lucia processional included Kaydence Thatcher, Alexi’s sister, and Marian and Catie Seely, daughters of Scott and Marie Seely of Ephraim. 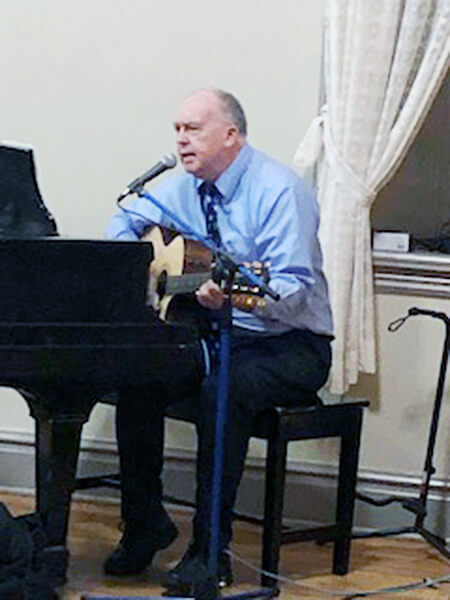 The evening concluded with Alexi reading fairytales to children from the audience and Ephraim City Councilman Greg Boothe leading the audience in Christmas carols.